When the things we treasure most are irreplaceable, protection becomes more important than ever. Keep your kids, pets, property, and personal belongings safe and sound with your mini spy camera with Wi-Fi by Duddy-Cam! Duddy-Cam does the dirty work so you can experience peace and calm at home, at work, or on the go. See your world from every angle! Smart access-there's an app for that! Download it to your iPhone or smartphone! Wifi access-double passwords double your privacy and fend off hackers! Remote Access - power on/off and more through the app! Real-time monitoring function - livestream via the app! Motion Activation - capture a still, start recording, and even send a notification to your phone! 30-Day warranty for defective parts - receive 100% refund or FREE replacement! Customer service - here to 'lens' a helping hand! Get unbelievable footage, completely under wraps. Add a mini spy camera by Duddy-Cam to your cart TODAY! 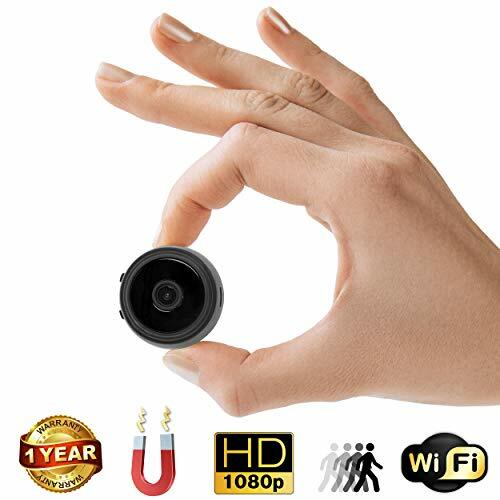 ✅ MINI & MULTI-USE - Duddy-Cam's mini spy camera with Wi-Fi is your eye when you're not around! The Wi-Fi spy camera captures pictures, records video, and offers remote access live stream through its iPhone app! It makes a stellar spy camera for the home, yard, or office, as well as a perfect pet or nanny cam!  HIGH-DEF PICTURE - Catching a critter or culprit in action is impossible with poor picture quality. Duddy-Cam wireless cameras provide clear, concise images with a 1080p HD camera! The wide 150°-camera angle means you can rely on high-resolution results around the clock!  NIGHT VISION - You're never left in the dark with Duddy-Cam! Mini infrared LED lights in your spy camera create sharp night vision up to 5 meters away! Pitch dark? No problem! The motion-sensored camera activation makes for a great home security system indoors or outdoors. TOP SECRET SURVEILLANCE - Trust your mini spy camera by Duddy-Cam to see what you can't! At just 35mm wide, your subtle hidden camera won't attract attention. Mount your magnet camera in the home, the shop, or the car! The indoor and outdoor wall camera won't flash or make noise - not even in night mode!  BONUS MEMORY CARD READER - Duddy-Cam doesn't make you buy an SD card reader separately like other wireless camera systems do! This double-sided reader features a USB and micro USB plug, so you can read and watch footage from your PC, Laptop, Smartphone, and Tablet! And use the FREE metal sticker plate, to attach your camera anywhere - just slide a magnet onto it and start surveilling! If you have any questions about this product by Duddy-cam, contact us by completing and submitting the form below. If you are looking for a specif part number, please include it with your message.